Toast the panko with the vegetable oil in a large skillet until browned, stirring frequently (about 8 minutes). Place in a shallow bowl and allow to cool. Spray a metal cooling rack lightly with oil. Place over a sheet pan. Cut the chicken into strips and then into roughly even sized chunks. Season with salt and pepper. In one shallow bowl mix flour, garlic powder and cayenne. In one shallow bowl whisk egg whites, water, mustard and thyme. 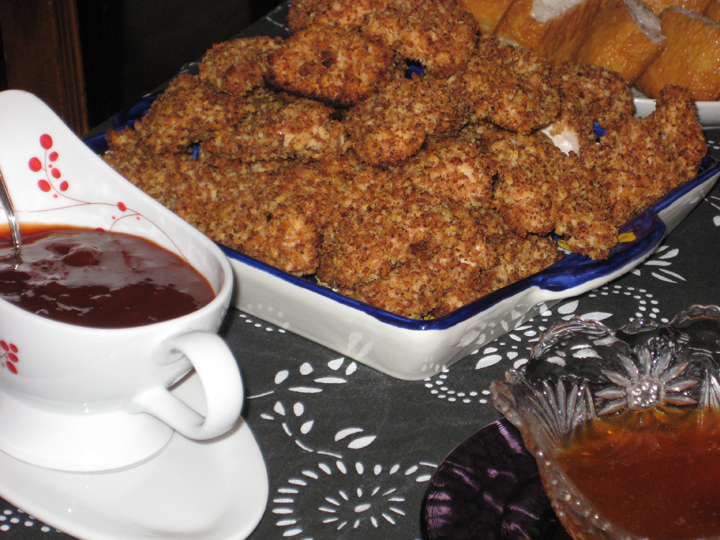 Dip each piece of chicken in flour, then in egg white mixture, then dredge in the panko bread crumbs. Place on rack. Spray the chicken pieces lightly with vegetable oil. Roast in a 475 oven for 10-15 minutes until chicken is cooked through and crispy. Because some people are BBQ sauce on their chicken nugget kind of people. Bring all ingredients to a simmer in a medium saucepan. Reduce heat to medium low and simmer about 10 minutes, stirring occasionally. Season to taste with salt & pepper. Cool. Dissolve yeast in warm water in a mixing bowl. Combine milk, sugar, salt, and butter, and heat to 110 F. Add to yeast mixture along with 3 cups flour. Beat for 3 minutes. Add enough remaining flour to make a soft dough and turn out onto floured surface. Knead for 3-5 minutes, or until smooth and elastic. Place in a bowl, cover with a wet tea towel, and let rise 1 hour. Punch dough down, and divide in half. Let dough rest for 10 minutes. On a surface generously sprinkled with cornmeal, pat or roll dough to 1/2 inch thickness. Cut into circles with a floured 3-inch biscuit cutter. Place circles onto ungreased baking sheet. Cover with a dry tea towel and let rise 30 minutes. Place risen muffins gently onto a medium-hot griddle or skillet and cook for 10 minutes on each side. Cool on a wire rack. 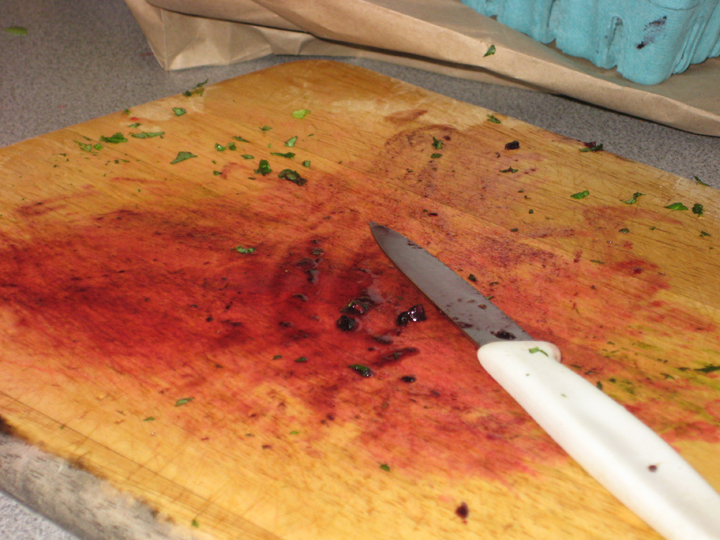 Split with a fork and toast before serving. Grate pear onto a paper towel and allow to drain while you assemble the rest of the ingredients. Stir together all ingredients in a large bowl until combined well. 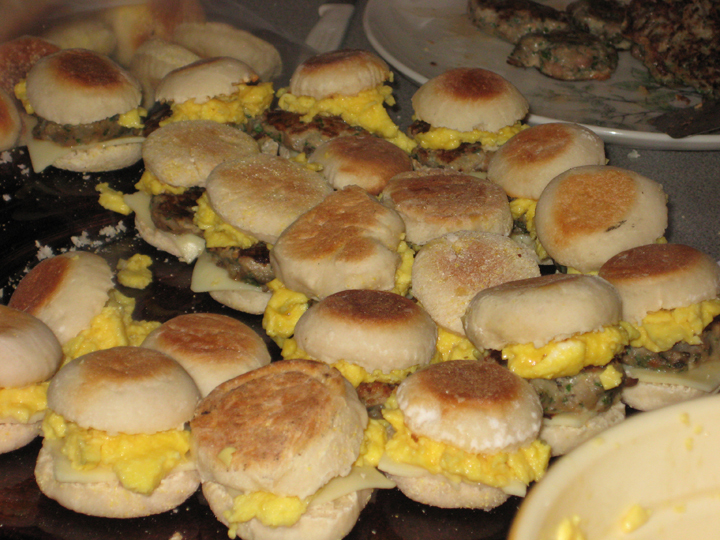 Form 1/8 cups of sausage mixture into patties using moistened hands and arrange on a wax-paper-lined tray. Lightly brush a 12-inch nonstick skillet (or griddle pan) with oil and heat over moderate heat until hot but not smoking. Cook patties until browned and cooked through, about 2-3 minutes/side. Transfer to a plate as cooked and keep warm, covered with foil. Patties can be formed (but not cooked) up to 3 hours ahead and chilled, loosely covered with plastic wrap. I toyed with the idea of baking the eggs in the oven, but could never find a recipe that I didn’t think would turn the eggs to rubber. Plus, as it turned out I didn’t have oven space to do that anyway. So, I beat 12 eggs with about 1/3 cup of milk and slow scrambled them on the stove top (about 30 minutes to cook). This worked perfectly. Sift flour and salt together in a large bowl. Cut the butter into the flour until the mixture resembles a coarse meal with some butter lumps (roughly pea sized). Beat together the egg, water and vinegar. Add egg mixture to the flour mixture, stirring with a fork until just incorporated (mixture will look shaggy). Turn out onto a lightly floured board and gather together. Knead gently with the heel of your hand once or twice, just enough to bring the dough together (you can do this in the bowl if your bowl is big enough). Form the dough into two flat rectangles and chill, wrapped in plastic wrap, for at least 1 hour (and up to 6 hours). Preheat oven to 400 and line two baking sheets with parchment paper. Divide dough into 24 equal portions and form each into a disk. Keeping remaining pieces covered, roll out one piece on a lightly floured board into a 5” round (about 1/8” thick). Spoon 2 Tbsp of filling into center and fold dough in half, enclosing the filling. Press the edges together and then crimp decoratively. Repeat with remaining 23 pieces of dough. 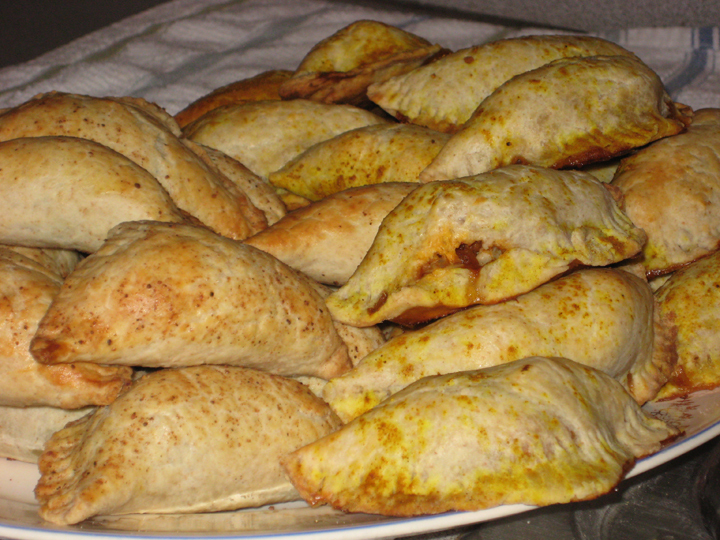 Lightly brush empanadas with egg wash and bake until golden (about 25 minutes). Transfer to a rack and allow to cool 5 minutes before serving. Cook the spinach until it wilts down. Transfer to a colander to drain. Heat olive oil in a pan. Add raisins and cook about 1 minute until they are puffed and slightly caramelized. Remove to a bowl. Saute the apple over a fairly high heat until it caramelizes slightly. Remove to bowl with raisins. Reduce the heat and sauté the onions until deeply caramelized, stirring occasionally – about 20 minutes. Deglaze the pan with calvados. Simmer until all the liquid has been absorbed/reduced. Remove to bowl with apples/raisins. Squeeze as much water out of the spinach as you can. Roughly chop. Add to bowl. Mix in enough goat cheese and ricotta for the mixture to hold together, but not enough to overpower the apples and spinach. Preheat the oven to 425°F. Drizzle a rimmed baking sheet with oil and spread the cauliflower out in a single layer; drizzle with a little more oil and toss the cauliflower around with your hands to coat the pieces. Roast for 15-20 minutes, until tender and golden on the bottoms and edges. Meanwhile, heat a generous drizzle of oil in a large, heavy skillet. Add the onion and cook for a few minutes, until starting to soften. Add the ginger, garam masala, cumin, chili powder and salt and cook for a minute, then add the tomatoes and potato. 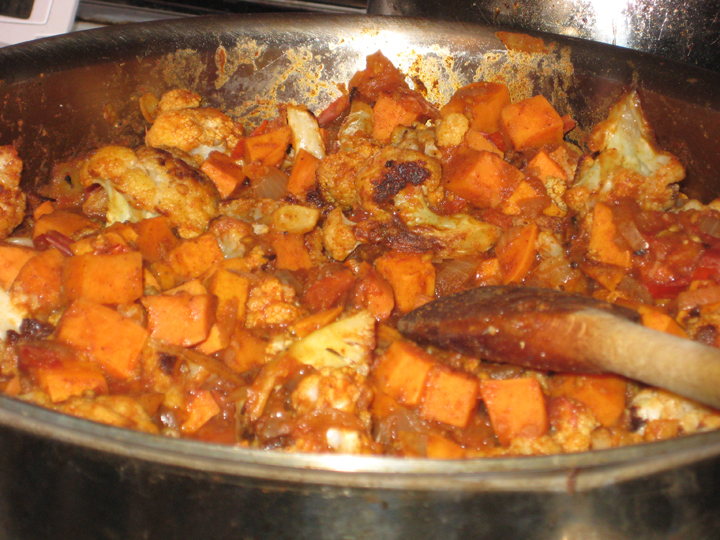 Stir to combine everything well, pour ½ cup water over top and cover with a lid; reduce the heat to medium-low and cook until the sweet potatoes are tender – about 15-20 minutes. Add the roasted cauliflower to the pan and stir to combine everything well. Cool. Then proceed as above. Mix together cinnamon and sugar in whatever proportion pleases you – I think I usually use about 3 Tbsp sugar to 1 tsp cinnamon. Brush tortillas with a little melted butter. Sprinkle with cinnamon sugar. Cut the tortillas into wedges. Bake in a 350 oven for 8-10 minutes, watching them to make sure they don’t burn. Transfer to a wire rack to cool. Either serve immediately, or keep in a tightly sealed bag. 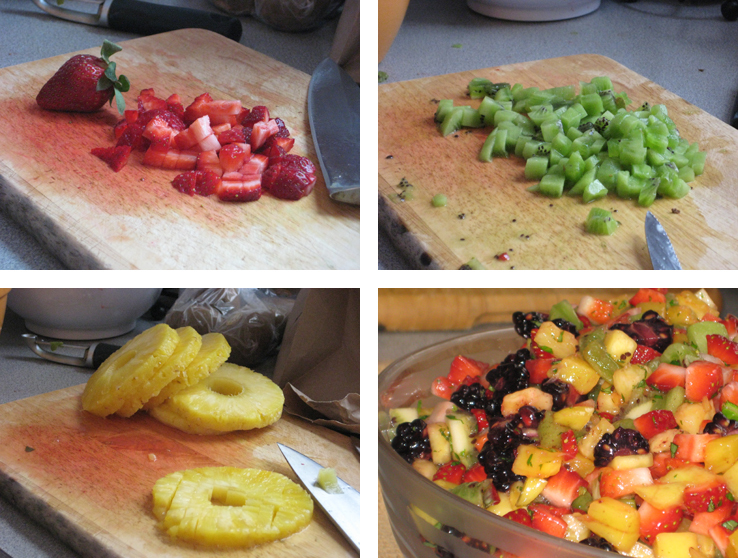 Toss the fruit gently with the honey, lime juice, mint. Refrigerate for a few hours. 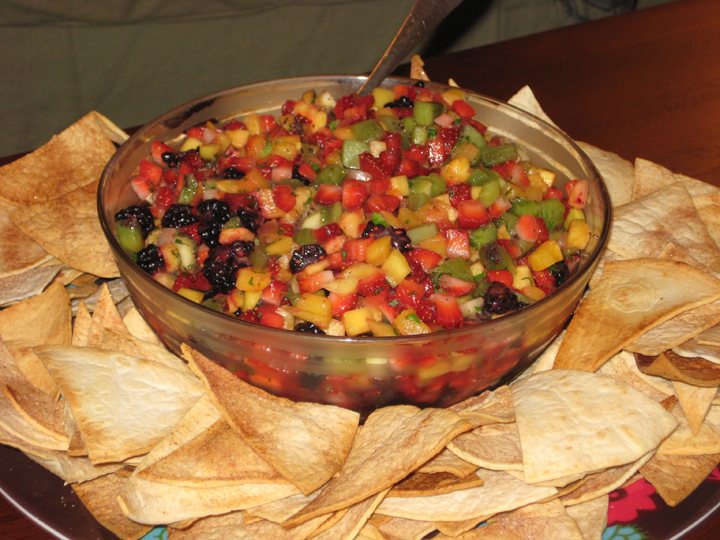 Serve with cinnamon chips.